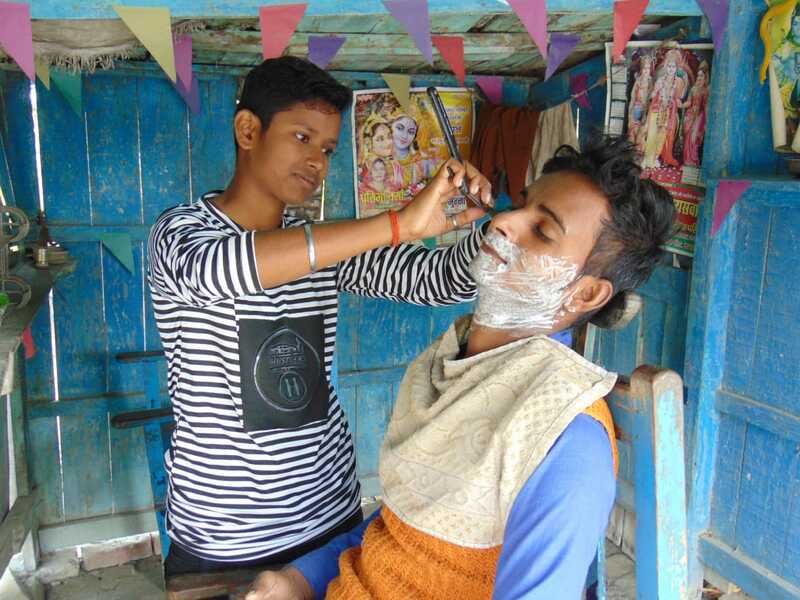 PATNA: Two teenaged girls from India are being heaped with accolades after they ran a gents’ hair cutting salon disguised as boys for as many as four years so that their family members didn’t die from hunger. Jyoti Kumari and Neha Kumari, aged 18 and 16, ran their father’s ancestral business of gent’s salon at Banwari Tola village which falls under Kushinagar district in Uttar Pradesh state after finding no alternative for survival of their family which comprised their bed-ridden father, aged mother and three little girls but no brothers. Also, the poor family didn’t have any landed properties. The school-going girls were compelled to handle male customers—giving them haircuts, shaving beards and trimming their moustaches—after their father Dhruv Narayan who ran this shop earlier and was the lone source of livelihood suffered serious paralytic attacks in 2014. The sudden and severe paralysis attacks left the head of the family on the bed, resulting in instant closure of salon and start of hard times for the family which was literally pushed on the brink of survival, family members said. The incident took place at a time when the both these girls were studying in a local government school. “As the battle for our survival got tougher, we restarted our father salon one day to earn something. Soon came a young customer but we observed his behavior was not good towards us and hence we decided to change our whole get-up so that none could identify us,” Jyoti told this reporter over phone. Very soon, both the sisters underwent a complete transformation. They dressed themselves up quite like males, sported boy’s hairstyle, wore stainless steel bracelets in hand, even changed their names like boys and also began behaving like boys. The result was that outside customers were just unable to identify them as they ran their business smoothly. Their “reincarnation” not only helped the family of five survive but also continue their studies further. Now, elder girl Jyoti has passed the grade 12 examination while her younger sister Neha is pursuing intermediate education. “We faced a lot of troubles when we started the job in 2014. Even co-villagers mocked us, ridiculed our works but we ignored their taunts and focused on our works since we had no option. Now we have gained enough confidence and don’t fear anyone although majority of people have come to know that we are girls,” explained Neha. The girls say they earn something between Rs400 to Rs500 per day which, they say, are enough to meet daily demands of their family and continue their studies. “This is an amazing story of survival which I thought must be known to the society,” said a local journalist Ajay Kumar Shukla. The girls said they would open the shop after attending classes in the school. “This way we earned money without disturbing our studies,” said Neha, younger sister who still is disguised as boy. His elder sister though has now begun keeping long hairs after gaining enough confidence. Recently, a team of local officials rushed to the girls and honoured them for their brilliant initiative. “They are the brilliant story of how one can survive battling all odds. The little sisters are the inspiration for the society and their story must be conveyed to told to the masses…We have never come across such an amazing story in our life,” a local government official Abhishek Pandey said. Dhruv Narayan is very proud of his daughters. “This gives me lot of pain when I find them at work but I am very proud of my daughters. They have extricated the family out of sudden crisis,” says Narayan whose treatment cost is also borne by these girls. He had married off four of his daughters from the income coming from this shop but got bed-ridden midway and it was his two daughters who later removed heavy burden from his heart through their sheer grit band dedication.